Linz 2009 European Capital of Culture - Linz09 and Hospitality. The Hospitality Programme wir09 helped Linz09 to boost the motivation and the commitment of the employees of all service sector businesses in direct contact with visitors. The aim was for most visitors to come to the conclusion that practically everything about the Culture Capital was to their liking. If the city left a lasting good impression on visitors, chances were they would decide to come back for another visit at some stage in the future and/or recommend Linz as a travel destination to others. The Hospitality Programme was targeted towards occupational groups such as taxi drivers, traffic wardens, police and emergency service personnel, shop assistants, public transport corporation employees and the staff of catering businesses and hotels. In its communication Linz09 emphasized the fact that all these people were part of the overall Culture Capital project and encouraged them to attend Linz09 events in addition to job-related information events. They would be more proud of their own city and more ready to infect others with enthusiasm about Linz09 if that enthusiasm stemmed from authentic experiences. The core area on which most of these efforts concentrated was a hypothetical “visitors’ corridor”, where the majority of the Culture Capital’s venues were located and where the highest concentrations of visitors were likely to occur. This core area also included entry points such as the airport, the main railway station and motorway parking lots; every effort was made to make these entry points hosopitable and inviting. The realisation of the ideas underpinning the hospitality drive was largely the work of the Economic Chamber of Upper Austria, which had started early on, for the benefit of its members, to collaborate with Linz09. It transformed its entire organisation and its networks into a sort of embassy for Linz09. Its Linz City branch and Linz09 organised eight information events for different sectors of the economy in June and November 2008 and another twenty or so for such subgroups as the employees to cab companies, for hotel and catering staff and for the Austria Guides. The bottom line of this particular initiative was that far more than 1,000 entrepreneurs and their staff ended up sharing a high level of informedness on Linz09’s most important projects, dates, information points and PR material concerning Linz09. They were also sensitized to their roles as co-hosts and co-hostesses of Culture Capital Year. The Economic Chamber’s City branch also initiated hotspots, the successful cooperation between 60 top hotels and catering businesses. 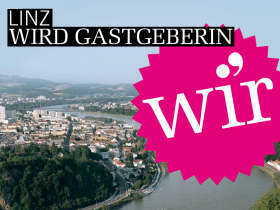 The list of significant partners also included Linz AG, ÖBB and Linz Town Council. In addition to laying on language courses and publishing a language guide and information folders, Linz09 and its partners organised roughly 150 road shows, information events, motivational training sessions, workshops and coachings for specialist occupational groups such as receptionists. Visits to the venues of Linz09 and guided tours through AKUSTIKON, the AEC and Linz Castle’s new South Wing were repeatedly on offer. While initial reactions to the programme were rather cool a spirit of cooperation soon became apparent. Businesses contacted Linz09 directly to order the wir09 file, which contained a language guide, a motivational booklet, a map showing Linz’s cultural institutions and the Linz09 venues, stickers, give-aways and a Linz09 programme. All this resulted in a number of changes for the better. To name but a few: the service of Linz taxi drivers improved in terms of friendliness, purveyance of information and cleanliness of the vehicles. All taxis for which a subsidy was claimed under a scheme initiated by the City of Linz and Linz09 had to pass muster. Linz AG created a 24-hour ticket. The City branch of the Economic Chamber sponsored a Linz09 window dressing competition, in which roughly 150 businesses contested an award for the most stylish shop window of the month decorated with Linz09 material. hotspots, an association of particularly ambitious and innovative catering businesses and hotels, was founded; new restaurants proved more flexible with regard to opening hours on Sundays and holidays. A guidance system for pedestrians was introduced. On days they were closed museums displayed information as to what other museums were open that day and what exhibition was currently showing there. Hotels, museums and other partners stocked and sold the Linz09 Card. The Austria Guides put their guided city tours under the motto “Linz. Verändert,”. The rates in multistorey car parks went down. Ticket machines went multilingual. The general condition and the standard of hygiene in public toilet was improved. At conferences that took place in Linz participants were informed about what was on in Linz during their stay; the organisers frequently made use of Linz09’s give-aways and presentation aids. A wide variety of companies and institutions including churches accommodated Linz09 dispensers stacked with info material on their premises. What proved more difficult than had been anticipated was persuading even flagship restaurants to stay open for business on Sundays and holidays and to introduce multilingual menus. This was a clear case where identification with the host role was found wanting. On the basis of their experiences with the hospitality programme, Linz09 formulated a series of recommendations for future decision makers. It is for instance advisable to have so-called “Gastrotester” or restaurant critics check up regularly on whether standards are being maintained in catering businesses and hotels. The introduction of menus in foreign languages is a matter of some urgency. The idea of the window dressing competition is too good to be abandoned by the Economic Chamber of Upper Austria and could at least be revived on the occasion of major cultural or other events. The organisers of major events and the directors of the city’s cultural institutions should cooperate more closely in future to be able to offer a well planned programme of highlights throughout the year which contains something for everyone. A successor product for the Linz09 Card and the Linz09 Insider is needed. The Tourist Info agency should stick to the newly won flexibility of its opening hours and consider itself a service point also for Linzers. The city should continue to use the formats introduced by Linz09 as regards flags and the branding of venues to strengthen its own brand and identity. Hospitals should continue to display information about the city’s cultural life on information steles. We would recommend introducing a chip system for public toilets liable to charges. The hospitality programme has undoubtedly improved the overall service competence in the city and has inspired enthusiasm for the host role across the board. This has not only made a substantial contribution towards the great success of Culture Capital Year but will benefit Linz also in the long term if the initiatives begun in 2009 are kept alive.